Let´s celebrate Love! If you choose Thailand as your honeymoon destination, you did the right choice. Thailand is beautiful, with a rich culture, stunning landscape, paradise islands, packed with options for dining and shopping. We are here to help you choose the best places and the best hotels for your Thailand honeymoon. More than a list of gorgeous properties, here you will find our personal touch, recommendation of places we visited, hotels we have stayed and loved! If you are seeking romance, relaxation, and want to indulge yourself with the best of Thailand, this post is for you… Tips for the best hotels for a honeymoon in Thailand, gorgeous places with interesting attractions and pristine beaches. I’m sure here you will find the best match for your Thai honeymoon dream. Koh Lanta is still an unknown destination for many tourists. The island is located in the South of Thailand, by the Andaman Sea. Close to Malaysia, this little paradise is a mix of culture, beaches and preserved nature. The south part of Koh Lanta is a Natural Park, the east part is covered by mangroves and local villages. On the west side, you can find hotels, restaurants, bars and gorgeous beaches. What we love about the Koh Lanta is the relaxed vibe, and the opportunity to find empty and secluded beaches. Yes, this is true, you can have a beach only for you, and there is nothing more romantic than that! For a perfect Thailand honeymoon in Koh Lanta you must stay at Crown Lanta Resort & Spa! The hotel is located on the top of a hill at Koh Lanta Peninsula, what gives you stunning views and privacy. The resort offers Deluxe Rooms and Villas, you can choose the best spot for you: by the pool or sea view. We stayed at the Ocean Sunset Villa and OMG!!! The view we had from our balcony was to die for, the room is huge [110 sqm] divided in one bedroom, the living area and the bathroom [our shower had an ocean view, causing endless romantic showers…hahah]. At Crown Lanta Resort you get everything you need and want for a Thailand honeymoon. Private beach, candlelight dinners, spa, two swimming pools and a delicious breakfast. Romance mood guaranteed during sunset session at the Reggae Bar. The stylish bamboo bar nestled at the rocky beach gives you the best spot to enjoy the golden sunset while sipping a cocktail. You can order delicious Thai dishes at the bar, or after the sunset move to the Cliff Restaurant for some seafood extravaganza. 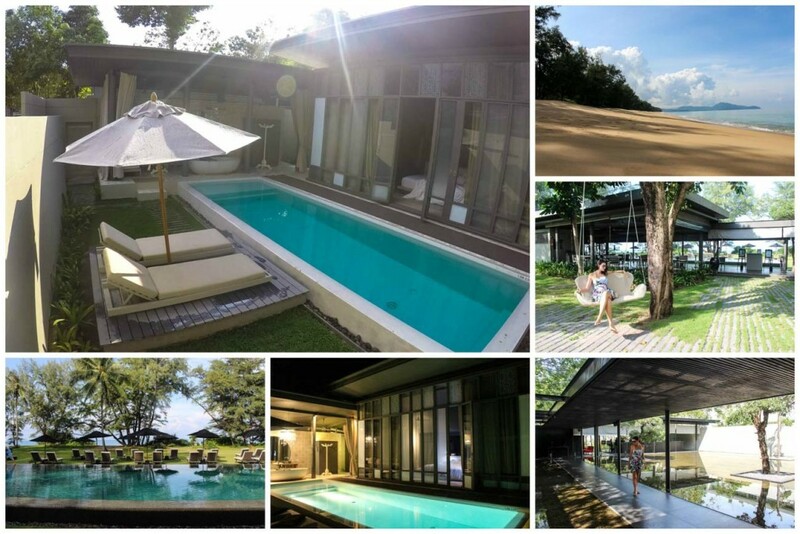 Crown Lanta is a perfect hotel for a honeymoon or for a romantic getaway, as we did. Because we don’t need special dates to celebrate love and be surrounded by majestic nature. How to get there: you can fly to Krabi and from there take a shuttle bus to Koh Lanta Saladan pier. Or you can arrive by boat, daily ferries to Koh Lanta from Phuket, Phi Phi and Aonang. The hotel will pick you up at the pier. Romantic Tip: ask for the honeymoon special services or romantic packages. Book Here » The most romantic villa for your honeymoon in Koh Lanta!! Aonang is located at Krabi area, famous for the Railay Beach and the boat tours around the islands. We have been in Aonang twice, and enjoy it a lot. What makes Aonang a good destination for honeymoon in Thailand is the diversity. If you want to relax you can, if you want busy beachfront bars you have, and if you want to get lost in the sea spending the whole day on a boat, you can go for it. Aonang is the right choice if you are planning your honeymoon in Thailand and want beautiful beaches, water sports, breathtaking cliffs and urban feeling. We have the perfect place for your honeymoon in Aonang. Stylish rooms, gorgeous views and the most incredible infinity pool in town… Aonang Cliff Beach Resort is the place to be if you are on a honeymoon or on a romantic trip in Thailand. For years, the resort has been famous for the service and the rooms, but the new wing it´s outstanding. We were there on our last trip to Aonang and couldn’t believe on the view we had from our Panorama Suite, the bathtub on the balcony, the giant comfy bed and our own espresso machine. Happy Romantic Days!! What do you want more? OK, for a perfect Thailand honeymoon you need a special breakfast buffet with open air tables only for Panorama suite guests? A pool with hydro massage beds and an unforgettable view of the cliffs and sea? Checked, Aonang Cliff Beach Resort has them all! Want something different and more exclusive for your honeymoon? Aonang Cliff Beach Resort has a private beach club waiting for you, the Andamana Beach Club. Relax in a very intimate atmosphere, with amazing restaurant and cocktails. Go there for a sunset dinner and fall in love for each other one more time. Romantic Tip: after a private boat trip around the islands, go the Peak Bar on the rooftop of the hotel´s new building. Best view from the city and an everyday natural spectacle. Book Here » The best view for your honeymoon in Thailand!! Phuket has been on the romantic radar for ages. And yes, the island keeps surprising us. Many travellers tend to say that Phuket is too touristy and it doesn’t have the paradise feeling anymore. We respectfully disagree!! You need to find the best spots in Phuket and get away from the overcrowded Patong Beach. For me, Phuket is synonymous of luxurious holidays, 5-star hotels, intimate spa treatments and food from heaven. With all these qualities, of course that Phuket is one of the best honeymoon destinations in Thailand. For the most romantic and luxury honeymoon in Thailand stay at Sala Phuket. Located in the north of the island, it´s close to the international airport and to the least known beaches. Mai Kao beach in front of the hotel is stunning, with transparent water and relaxing vibe, you gonna spend hours there soaking under the sun. Although, for me the best feature of the resort is the Private Pool Villa. With a Sino-Portuguese architecture, the villa has a huge private swimming pool, open-air bathroom and a bathtub under the stars… Romantic, Romantic, Romantic!! You and your lover will be pampered with signature organic products from head to toe, daily special teas, fresh fruits and pillow menu. You will want to stay in your villa forever, and no one will judge you! 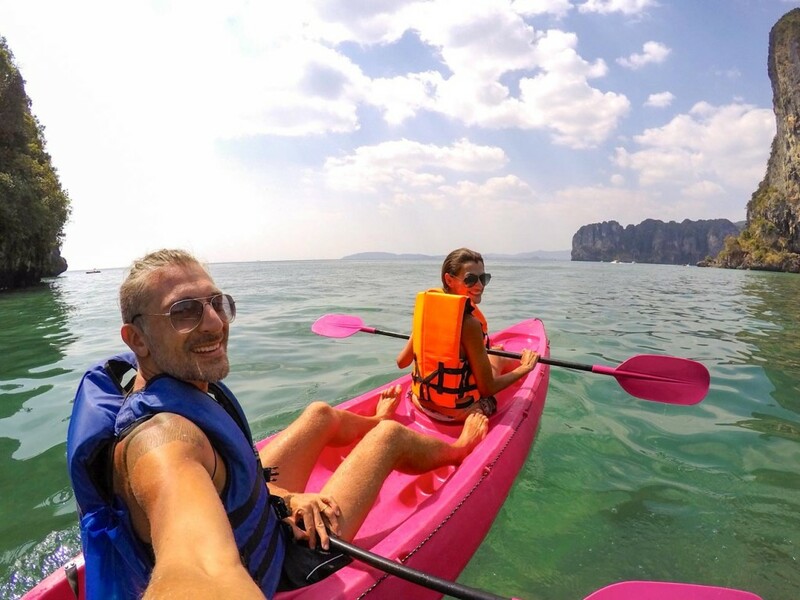 It´s your Thailand honeymoon, enjoy every second of it! The resort has a pool in front of the sea, a big garden with open-air movie sessions, an international restaurant offering a great selection of wines and a twist between Thai and Italian cuisine. Breakfast can be served on your room, or at the beach restaurant, your choice! 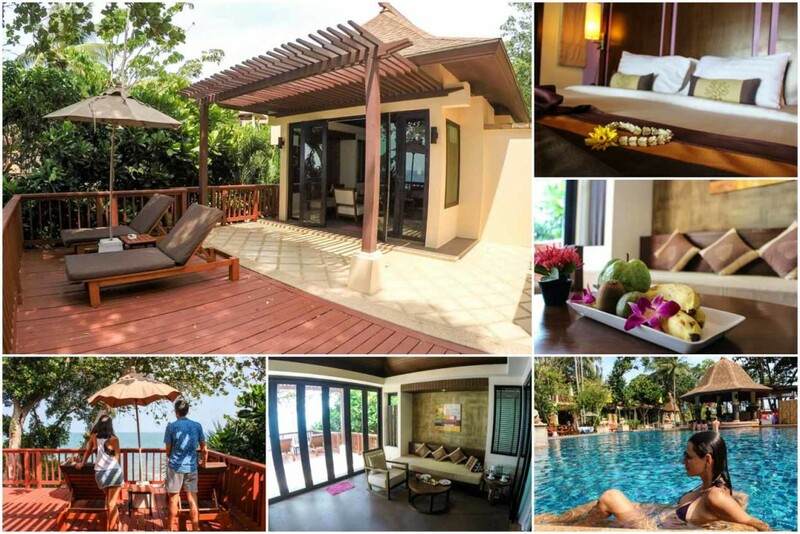 If you feel like leaving your pool villa and discovering Phuket island, we have a special travel itinerary for you. After two trips to Phuket, we put together an ultimate guide with the best of the best in the island and the top things to do in Phuket. How to get there: You can fly to Phuket [best flight rates here] or reach the island by boat. Most of the islands in the Andaman sea have daily ferry services to Phuket. From the airport /pier you can get a taxi to Sala Phuket resort, or book with them a pick up service. Book Here » The most Luxurious Honeymoon in Phuket!! If you are like Rob and I, an urban couple that gets thrilled while discovering the enchantments of a big city, a honeymoon in Bangkok is for you! Known for the Buddhist temples, the serious shopping and crazy nightlife, Bangkok also has a diverse dining scene, with romantic rooftop bars, intimate restaurants and hotels to die for. Who said that a perfect Thailand Honeymoon needs to be by the beach? I will prove that Bangkok is a romantic destination too! We choose Bangkok to be the place to celebrate our 10th anniversary together. We decided to do our second honeymoon in Thailand and Bangkok was where everything started. A big thanks to Tracie Howe, travel writer and destination wedding photographer that had this crazy [and awesome idea] to do a romantic photo shooting at Lumpini Park. We love it!! 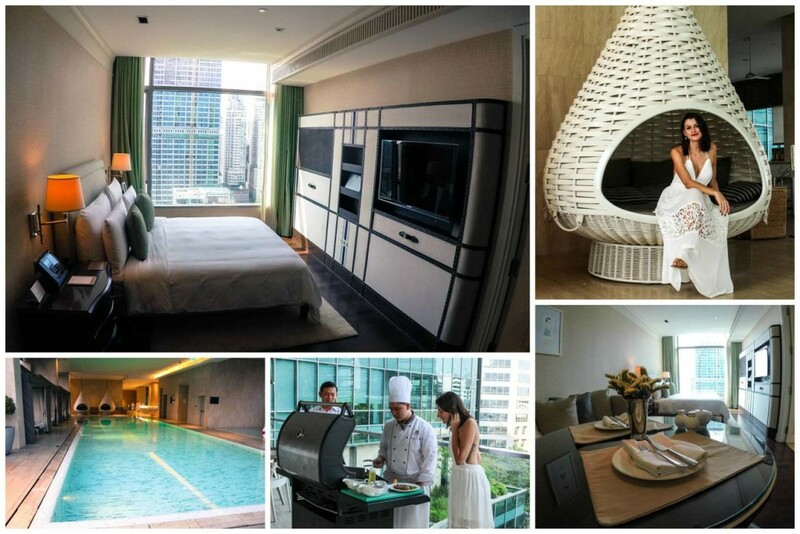 For the ultimate honeymoon in Bangkok, we choose to stay at the chic and classy Oriental Residence Bangkok. The hotel has everything you need and want in a big and busy city. Intimate atmosphere, personalized service and rooms that you wish you could stay forever. The hotel decor is flawless, chic at the right point, you feel good to be there! We stayed at the Grand Deluxe Suite, that’s much more than a hotel room. We had big windows facing Lumpini Park, king size bed, living and dining area, a huge bathroom with tub and closet, plus a fully furnished kitchen. When I said we could stay there forever I wasn´t joking, Oriental Bangkok Residence gives you the homey feeling with elegance, and in the heart of Bangkok. The breakfast is served at the Claire Café, a modern and stylish café famous for the gourmet food and the traditional afternoon tea. When you get tired of the busy Bangkok, go for some relaxing time by the pool. The egg chairs are an invitation for some romantic snuggles, and the perfect spot to contemplate Bangkok’s skyline. Love the view, love the pool, love the hotel, love to be there with Rob… That’s how a Thailand honeymoon trip should be, all about love! How to get there: The hotel is the heart of Bangkok, few meters from Lumpini Park, Sukhumvit Road and surrounded by embassies. To get there from the airport, you can take a taxi or take the airport link train, connect with the BTS line till Ploenchit Station. Romantic Tip: For your romantic dinner, the hotel houses Savelberg Thailand Restaurant, with French cuisine and a wide selection of wines. Don’t forget to book your table in advance. Book Here » The best honeymoon hotel in Bangkok!! Looking for a different experience during your Thailand honeymoon? So go to the mountains in Chiang Mai. Believe me, Thailand is much more than stunning beaches and busy Bangkok. The Thai hospitality in the north is incredible, you will be surrounded by green hills, waterfalls and you can enjoy the best massages ever. Famous for the Buddhist temples and street markets, Chiang Mai is perfect for couples that like nature, trekking, yoga, waterfalls, and romance! 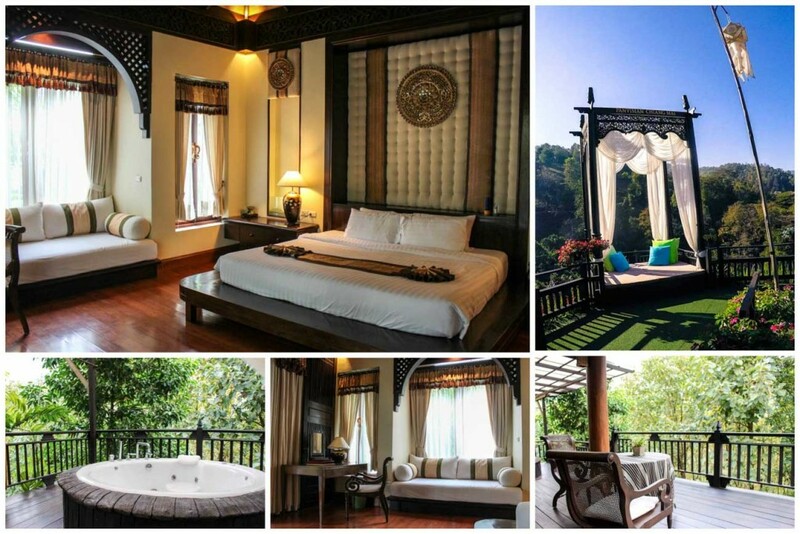 The best hotel for a honeymoon in Chiang Mai is Panviman, nestled in the mountains you will have gorgeous views and wildlife. The building is in Lanna style, with a traditional wooden high ceiling, a decor that will transport you to the ancient times of Thailand. The Jacuzzi Villas are beautiful, with hand carved furniture and a jacuzzi on the balcony… Everything was thought to give you comfort and relaxation. Panviman resort is big, the chalets are spread around the green property, with a leisure area that includes a waterfall swimming pool, open air jacuzzi, fitness center, meditation cave, yoga retreat and a full spa ready to give you the best couple massage ever. If you are looking for a unique honeymoon in Thailand, Chiang Mai is a lovely destination. There you be surrounded by nature and will have a chance to experience some Thai adventures. Apart from indulging yourselves in the hotel, go for a trekking and coffee tasting tour, we did it and loved! How to get there: You can fly to Chiang Mai and arrange the pick up service with the hotel. It will take about 30 minutes from the airport to the resort. 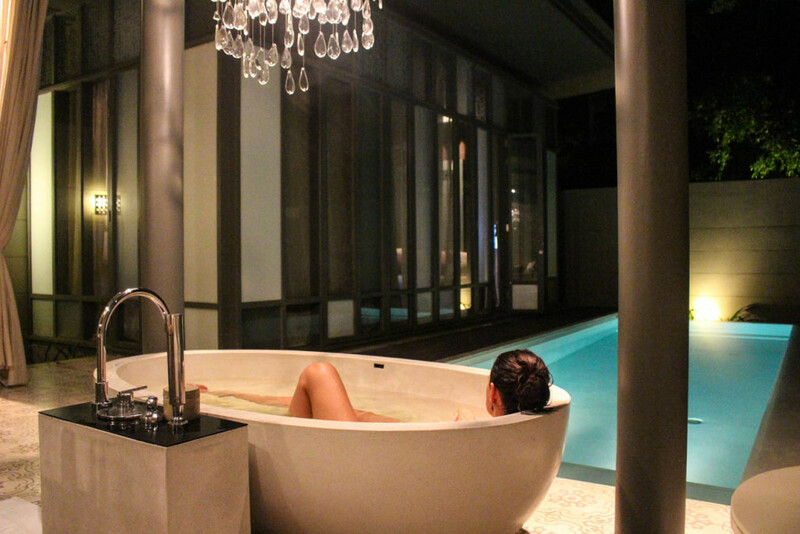 Romantic Tip: Ask the reception to organize a Thai bath on your private jacuzzi, order some wine and enjoy the bubbly bath. 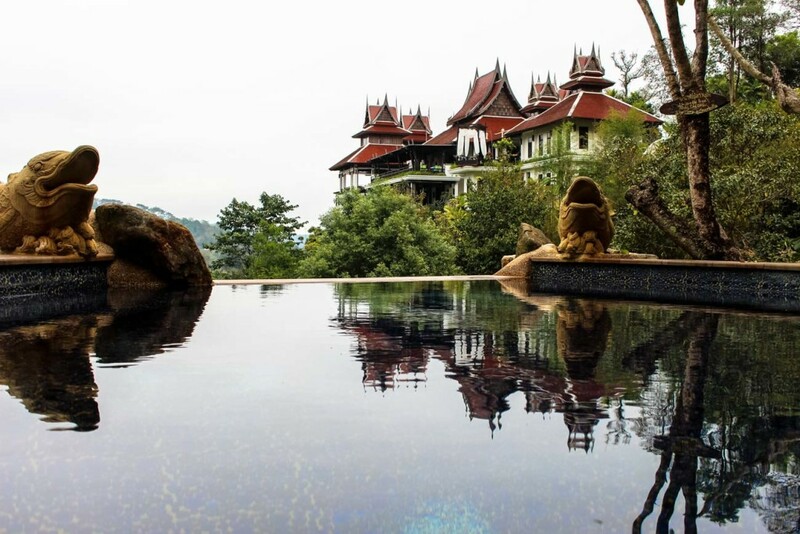 Book Here » Be surrounded by green mountains on your Chiang Mai Honeymoon!! Thailand is a romantic destination, no doubt about it! And you don’t need to be on an official honeymoon to enjoy this stunning scenery and pamper yourselves with the best hotels in Thailand. We don’t need excuses to celebrate love! For an even more romantic experience, what about proposing or getting married in Thailand? All the hotels we mentioned have the wedding service, contact them for packages and have the ultimate romantic trip to Thailand. Looking for another island or Thai destination that is not on this post yet? Don’t worry, we will update this article as soon as we visit other romantic and honeymoon destinations in Thailand. 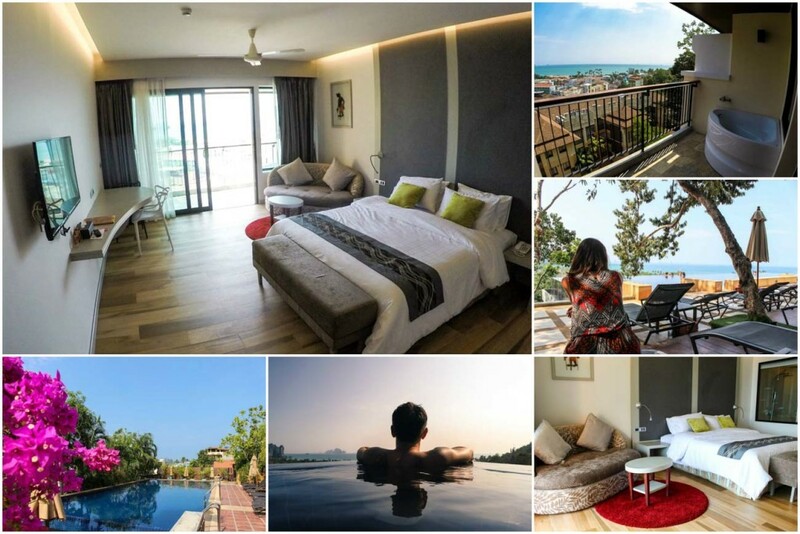 If you are looking for a top and luxurious hotel in a city that is not mentioned above, we suggest to book through Agoda or Booking.com, they have the best properties and great deals. Are you planning a honeymoon in Thailand? Or need a help to plan your romantic trip to Thailand? Leave a comment, we love to help you! Wow, looks like you 2 had a great honeymoon in Thailand. Im happy for you both and congratulations on your wedding. Thailand is perfect for a romantic trip! While I’m not honeymooning any time soon (married with 2 middle schoolers!) I’m very intrigued by Thailand and all the beauty it has. I’d love the more secluded Koh Lanta and I already have Chiang Mai on my list. It looks like you had an amazing time and congratulations on getting married! We had a great time in Thailand indeed! Thailand is very touristy destination, but you still can find hidden gems. Koh Lanta is one of the most untouched islands and Chiang Mai, even being a packed with travellers is a must visit place. I’m so bookmarking this. It’s too late to plan a honeymoon (ours was in Europe) but these hotels look like fantastic romantic stays for any couple. I’ve been especially curious about Koh Lanta and now I know where to stay. Go to Koh Lanta, you won´t regret Carol! And if you really wanna enjoy a relax and romantic atmosphere, go there on low season (April – May), the beaches and street get empty, the weather is hot and you can enjoy the islands and the resort only for yourself! Thailand is certainly a great country to have a romantic honeymoon, great photos of the islands and you 2 make them even more beautiful. I really liked Ao Nang and think it would be a great place for a fantastic time with your partner! Thailand is so beautiful that we don´t need to be good models, everywhere you look you find stunning scenery. Koh Lanta and Chiang Mai would be my perfect combination – the mountains of the north and the beaches of the south – perfection! Koh Lanta is amazing, stunning beaches, great resort and relaxed vibe, perfect to enjoy a romantic getaway! The resort is stunning and the mornings there are beautiful and mysterious, with the fog covering the valleys and the sun shining above the mountains… Unforgettable! The hotels and resort in Thailand are amazing indeed. Even being a country that receives tons of tourists every year you still can find hidden gem and stunning scenery! Thailand is absolutely stunningly romantic! Great place to celebrate love. 🙂 Congrats on 10 years togther (if I understood correctly), and what a fabulous place for a second honeymoon! Thanks!! Has been 10 years together, what a journey! 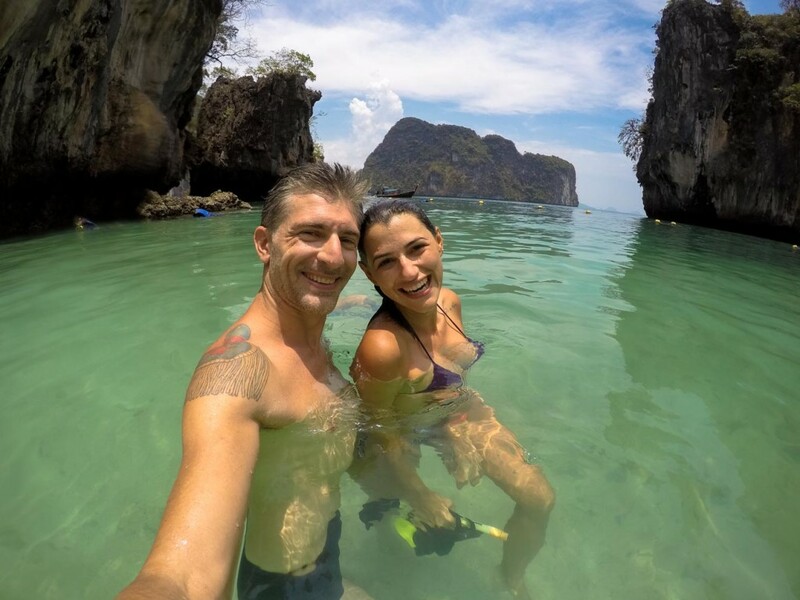 You two definitely should come to Thailand for a romantic/adventure trip! Wow! Truly a honeymoon in paradise! Congratulations! No wonder I visited Thailand 8 times! How are you guys? Travelling a lot? Thanks for stopping by and hope to meet you soon! All the best! Wow this looks like a beautiful place for a honeymoon! Thailand is perfect for a honeymoon, you get everything you want and need. From paradise beaches to cosmopolitan cities! Thanks for the lovely comment and for mentioned us on your blog post. We didn´t expect. Happy to know that our passion for travel and blogging is leading us through the right path. All the best guys, hope to catch up with you two soon! Hi! My Fiancee and I are looking to book a honeymoon to Thailand. Where did you start off your honeymoon and did you book ferries/transportation to other area of Thailand while you were there or before you left? We started in Bangkok and then moved to the islands. You can book the ferries, bus or train when you arrive in Thailand. For flights is better to book in advance. Also hotels, Agoda is our favorite tool to search & book hotels in Asia. Is november a right time to visit thailand. November is the beginning of the dry season in Thailand, a good time to travel there. In the north and Bangkok will be mostly good weather. The Andaman coast will be dry too, you can get a little bit of rain if you travel to the islands on the Gulf (Koh Samui, Koh Tao and Koh Phangan) the rainy season there finishes in November. Hope you have a wonderful time in Thailand! This is amazing! A honeymoon in Thailand looks like a dream come true! My soon to be husband and I are planning our honey moon to Thailand this year. Can you give me numbers please? How much the trip cost you and how much money did you need extra ? Congrats for the wedding!! Wish you lot of happiness! I don’t have the total costs of this trip, as I visited the places separately. But I wrote another big guide about the prices and costs of travelling in Thailand, on this post you can find a lot of information to help you plan your honeymoon. You’re really making me want to go back to Thailand right now! We didn’t get to give Bangkok enough of a chance since we used it as a hub to get to the islands and Chiang Mai. We also haven’t experienced Phuket together! I love Koh Lanta though! Gorgeous photos, I also love your dress from the photo of the Grand Deluxe. Let’s all go back to Thailand, I’m missing this stunning country too! Next time give a try to Phuket and stay a bit longer in BKK, I’m sure you will love it! All of these look amazing but especially the Sala Phuket. I would love to stay there. I’ve actually stayed at the Panviman and loved it! It is an amazing property as well. Great list and your photos are awesome! Wooow, you have stayed in Panviman, I miss so much the green mountains of Chiang Mai. Thanks for stopping by Nathan, happy travels. So many great options but we’ve only been to Phuket so far so lots of romantic getaways to still to consider. I think we’d split our time between Bangkok and Chiang Mai next time. I love the two cities and visiting them you can have the best of both worlds: nature in Chiang Mai and luxury urban life in BKK. These look like some great places to stay even without the honeymoon. Just a great place to kick back and enjoy life. So true Holly, these hotels and resorts are awesome for solo and friends trip too! It’s a good thing, or maybe not, but honeymoon and marriage are a long way off for me. I say that because this would definitely be a difficult decision to make. Thailand has so many beautiful islands to you can spend your honeymoon on. Reading through your list I have chosen the three I liked the most. They Koh Lanta, Aonang and Phuket. I bet was hard to choose your favourite places, but well done! Phuket, Lant and Aonang are amazing beach destinations! Wow amazing hotels! I cant believe you guys stayed at these places. Everything looks so beautiful and luxurious! I’ll definitely keep these in mind when I plan our trip to thailand. Great photos too! Sometimes I don’t believe we have visited so many amazing places, Thailand is a stunning country and great hotels are not expensive as in Europe or USA. With a medium budget you can do a lot there. These are all honeymoon worthy resorts and hotels you’ve chosen! I personally like the romantic atmosphere of having a great ocean view. Nothing more says romance than waking up next to your new spouse with a magnificent view in the morning. Totally Agree Erica! Beach hotels are perfect for honeymoon and romantic getaways. These are all incredible options for a honeymoon … or a second homeymoon even :D! 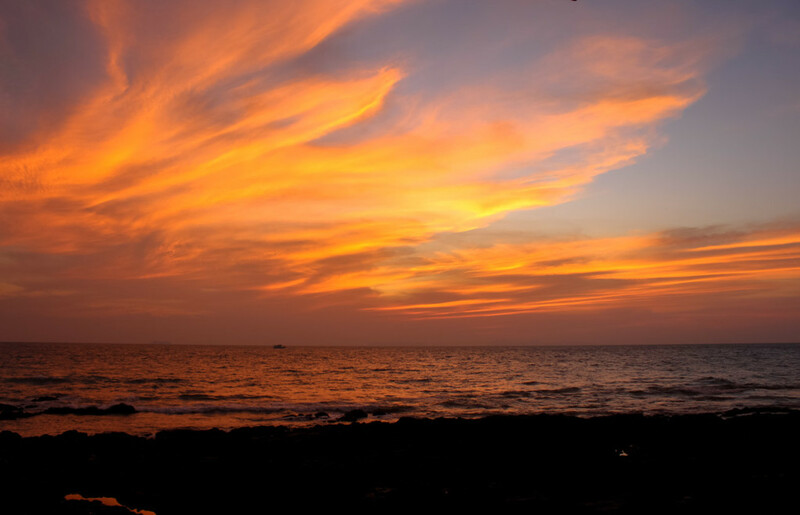 Secluded beaches & surreal sunsets sounds like the perfect combination to me, so I’m thinking that Koh Lanta might be the way to go. And I love that it’s still an unknown destination for many tourists 🙂 Thanks for the tips! Tks for stopping by. Koh Lanta is stunning, and I’m so happy that it’s not so famous among tourist [yet]. There you can really enjoy the Thai Island vibe. I am so bookmarking this. Me and my fiancee are going to spend the next few weeks going through your blog 🙂 Just a quick question, we are getting married in September, is that a good time to go to Koh Lipe? September is low season, cheaper but you have more chances to get rain. Sorry for such a late reply, the past weeks have been busy here. I feel you, it’s hard to choose only a few places when you want to visit all. Hope this answer arrive in time to help you plan your lovely honeymoon! I know y’all enjoyed the honeymoon, Thailand is on my Bucket list and my husband said for our one year we’d go, but we’re not one to just sit and relax, we like to stay busy and active. We’re also more the adventurous type and want to be able to see the elephants, hike, enjoy the beaches and just explore. How would you go about having an itennary but not planning every single detail? Hello, I am planning an engagement proposal at Koh Lanta and wanted to know if you had any tips for this. Which beach should I aim for. I’ve already booked at the Crown Resort. From your post, I learned that there are many beaches that might be secluded and alone. I’ve never been there. Any thoughts? Nui Beach and Bamboo Beach are beautiful and very quiet. Or you can arrange a romantic dinner at the private beach from Crown Lanta. Good idea! garden beautiful, i like…. Amazing pictures!! I really liked all these pictures. Thailand is the best place for the honeymoon with nice places and beautiful resorts! !